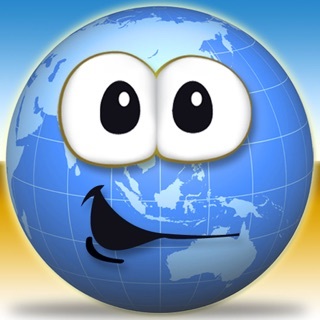 iWorldGeography is used by schools, libraries, and families in over 60 countries!!!! "Your iWorld apps were the first we found that we could endorse whole-heartedly … Thank you for your quality, real, Montessori apps." iWorldGeography United States includes a Montessori 3-part-lesson [introduce, recall, reconstruct], plus labeling. Student-centered, self-correcting, independent work blends seamlessly with existing curriculum or stands alone for home use. Free worksheets can be printed for follow-up, physical-world activities at home or in the classroom. Available to all at TenSunInteractive.com - Extras. 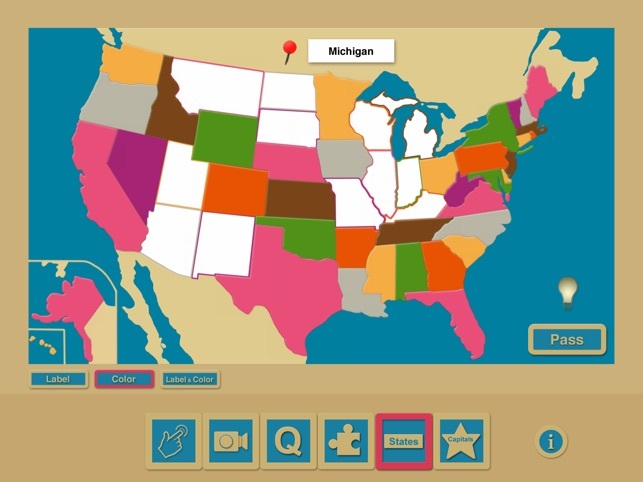 • Active Intro - Touch any state to hear its name. 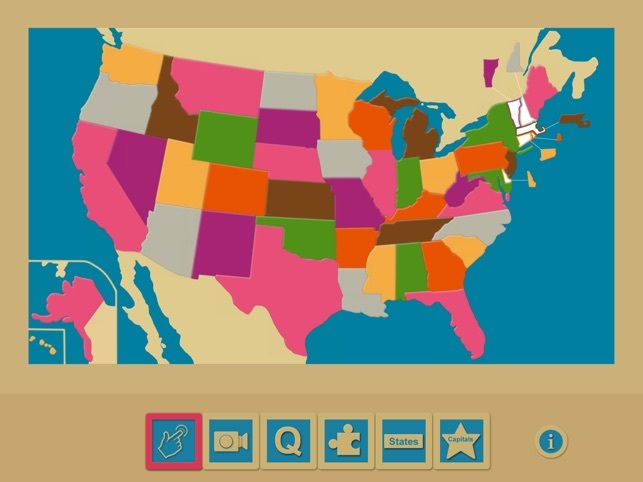 • Passive Intro - Movie introduces each state name. • Quiz - Name is played. 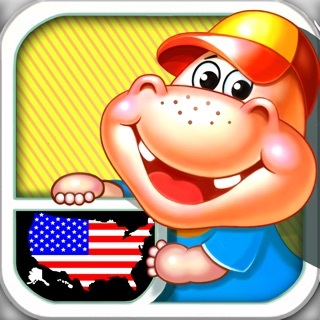 Touch any state to reveal answer. 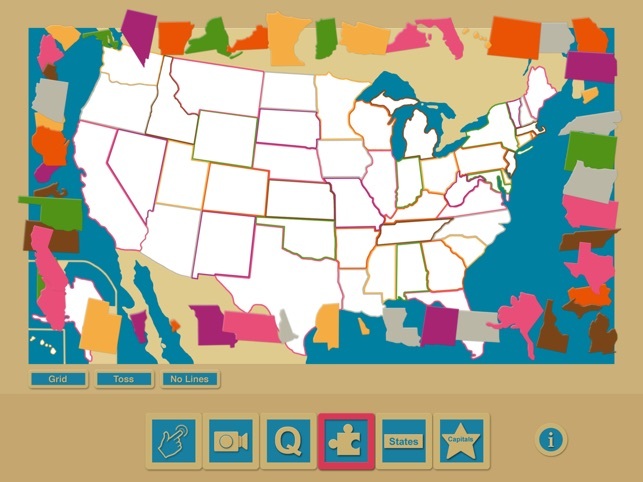 • Puzzle - Freely drag pieces to reconstruct map. 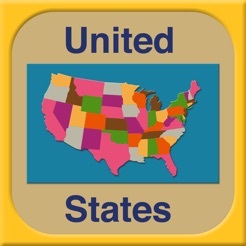 • Label - Pins drag freely to label states and capitals. • "Grid" - scatters pieces to screen edges. 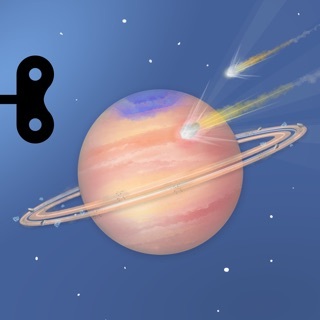 • "Toss" - scatters pieces randomly across screen. • "Lines/No Lines" - toggle to work with or without outline. • "Pass" - skips current label. • "Lightbulb" - toggles to show or hide control map. TenSun puts children in charge of their learning by allowing them to control the challenge level and depth of their lesson. There is no penalty for a wrong answer. The correct answer is simply reinforced. Activities are self-correcting. Children are free to work independently, in a small group, or with the help of a supervising adult at home or in the classroom. Touch Classroom Printouts button on app's title screen to access printouts for additional color, trace, and label activities. Or, visit TenSunInteractive.com's Extras page. Follow us on Twitter @tensuninteract for App, Update, and Online Extra alerts. Follow TenSun Interactive on FaceBook. iWorldGeography colors match American Montessori Society classroom materials. 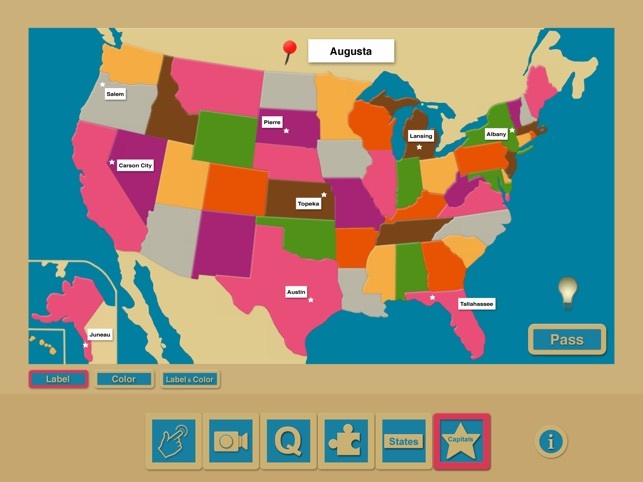 iWorldGeography Series blends self-correcting, child-directed-activity design with Geography curriculum used in Montessori Children's House and Lower Elementary classrooms. Concept and visual design is thoughtfully integrated to supplement existing curriculum and classroom materials. The series was inspired by 3-year's observation in Lexington (MA) Montessori School Children's House classrooms where MyWorld, TenSun's desktop-based version of this series, has been used since 2004. Now runs on iOS 11.